This blog reader picked a great theme for her letter to me! I am very impressed with all the batty-ness. The envelope is quite beautiful - I don't know if all the subtle colors really come through in this photo. What a treat! On another note, my apologies for fewer posts (and fewer letters and postcards written) lately. Sometimes, life just gets in the way... I've had some unexpected twists and turns at work that have been time-consuming in the short term and may continue to make things a little different, so as always, I'll keep plugging away and write when I can; it just may be a little less than I'd want to. I will update my letter stats for a new May chart shortly, too. What a wonderful letter your blog reader has made to you!!! Thanks for your nice comments on my envelope everyone. 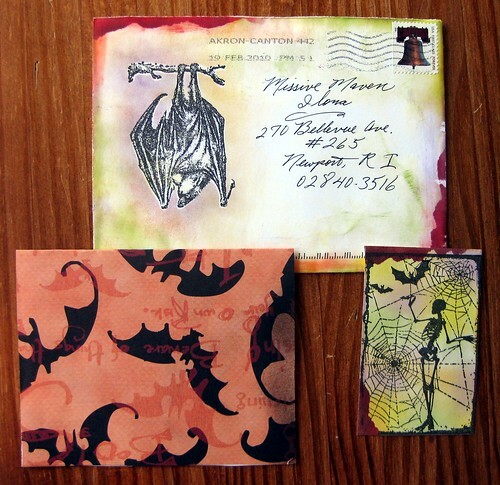 You might like to know that both the large hanging bat & the skeleton in webs with bats are both rubber stamps. The first is from Stamp Francisco, the second is from Stampers Anonymous, the Tim Holtz Collection. 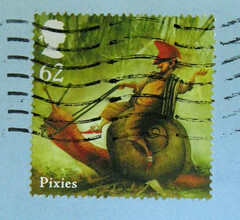 Thank you, MaryMargaret, for the stamp info - I know the readers appreciate it! And thanks for making such awesome mail art.